For your amusement/delight, this post is dedicated to the collection of tins. And many- many-many people do collect tins. I didn’t set out to collect them- but the kitschy images on these three totally sucked me in. We have two old biscuit tins and a sweets tin. 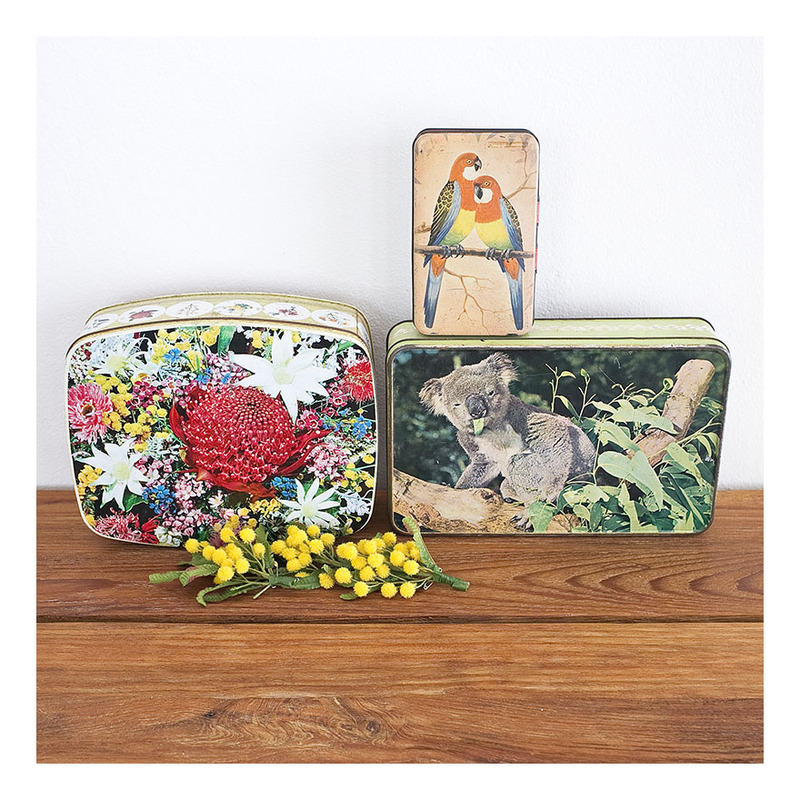 The ‘Australian Wildflower Series’ tin is a Brockhoff biscuit tin, made in the 1960s. There were 2 lbs of biscuits in there- and after the biscuits were eaten the tin could be used for storing all manner of things. The ‘Koala’ tin held 1½ lbs of Arnotts biscuits- back in the day when Arnotts was a wholly owned Australian company [ie: the 1960s.] A recent tin sold on Ebay for $61. These things are hot right now! And the ‘Budgie’ tin held sweets made by Gibsons, in Perth. All the tins have well preserved images on the front- and the lids and hinges are all in working order. The tin inside has discoloured in places, due to age; but I gather that’s what you want in these things. Too sparkly bright might mean it was a reproduction tin- and nobody wants one of those! I collect Diana pottery- and as a landscape architect I am particularly fond of the Australiana series of flowers produced in the 40s. Here we have the flannel flower, hand-painted- in a pie dish. The Flannel Flower is the floral emblem of NSW [and has been associated with this State since Federation in 1901.] 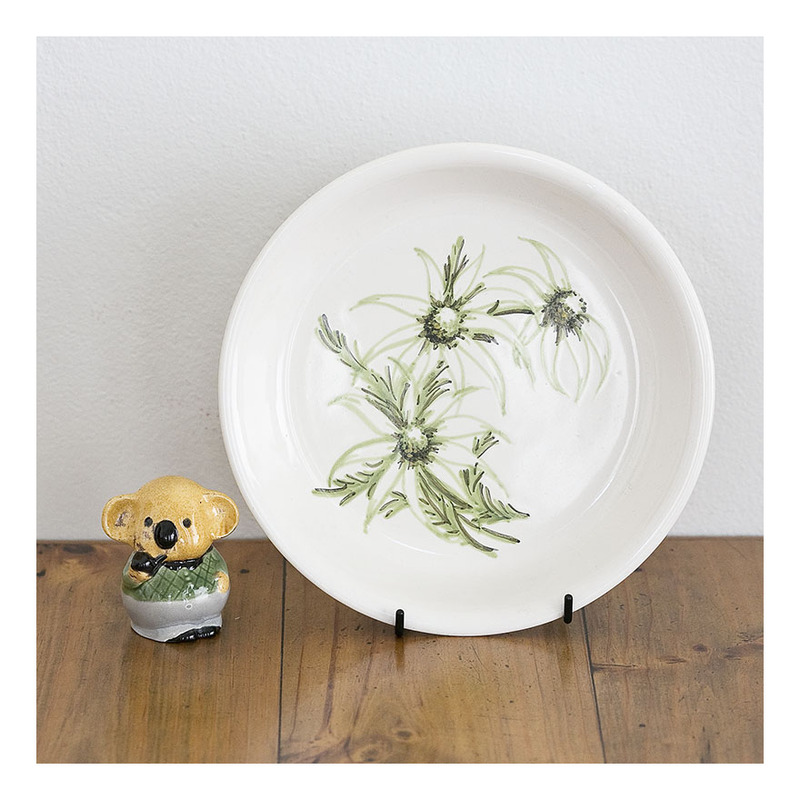 I wouldn’t say that this is a terribly accurate or particularly artistic rendering of the flannel flower but it represents an important milestone in Australian pottery- where the fashions and obsession with all things English were replaced with a nationalistic interest in Australian iconography. I have posted several other Diana Flannel Flower pieces [see several posts, below] but this is the first pie dish I have come across. It’s in excellent condition and clearly stamped Diana on the back. I’ve teamed the pie dish with a little whimsy- a 40s koala figurine smoking a pipe. Not so much Australian iconography as Australian kitsch at its best! For your delectation, a collection of koalas- fabric print and ceramics. Made in Japan- because- the 60s! The printed : a tablecloth 36” x 36” [914.4x 914.4mm] and 4 serviettes 11” x 11” [279.4 x 279.4mm.] Never been out of their box! Waiting to be used. The ceramics: a monochrome koala figurine, a koala planter, and a koala souvenir from Launceston [Tasmania]. This last one is the most precious of the lot. You can never have too many koalas. Especially since they are now on the threatened species list. Get them why you still can! Gempo pottery – like much of the 70s- is having a resurgence at the moment. Gempo pottery was made in Japan between1962 – and 1974 for the export market. The koala [and her joey] – have the large-faced form that marks all Gempo pottery. It is also particular to the 70s era with the stylised features, and the stoneware pottery glazed in rustic creams and browns. I’m not sure how many animals Gempo stylised on their mugs, but currently in my collection I have a spotted hippo, giraffe and elephant. Oh, and a leo-the-lion moneybox! 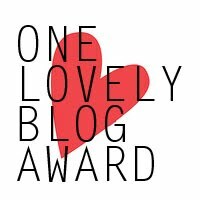 I’ve featured quite a bit of Mulga wood on this blog: . and a fair bit of kitsch. Often Mulga wood and kitsch go hand-in–hand, as is the case here. Mulga wood was used in 1940s souvenir works as it is a hardwood –unusual in a native from the wattle family – and was considered ‘export quality’. The timber is cut and arranged to show off its famous bi-colouring, as is the Australia-shaped base of this 40s souvenir. The clock- with alarm and glow-in-the-dark numbers and hands, is paired with a barometer [working; naturally it’s in Fahrenheit] and a gilt koala. The wind-up clock is functional- but I can’t attest to its accuracy. But a barometer and a clock and a gilt koala all on an Australia-shaped Mulga wood base? Doesn’t get much better! I’ve teamed the souvenir with a Bushell’s tea jar from the same era. The rusted lid adds another brown tone, and the glass picks up the glass on the clock and barometer. These canisters were made in the 80s; they have plastic lids [which are still air-tight and good for storing stuff]; canisters made in the 60s and early 70s had metal lids which weren’t so practical for re-use. Like the canisters below, the lids came in all manner of colours to make it easy to tell the jars apart. And they came in two sizes: as here, where we have one smaller size and two of the larger size. These mugs feature the abstract, large –faced form that marks all Gempo pottery. They are also particular to the 70s; with stylised features, and the stoneware pottery glazed in rustic creams and browns. We’re in the 70s folks! As the 70s becomes more collectable, so these stoneware pieces are becoming sought after. It was something that I did not predict, but have been caught up in. I love these old perpetual calendars- so kitschy and SO different to the orderliness of the digital calendars we are forced to view every day. This ‘Souvenir of Adelaide’ is made from Mulga Wood – – which has been cut and arranged to show off the timber and bark of the tree. Mulga wood was used in 1940-50s souvenir works like these as it is a hardwood –unusual in a native from the wattle family – and was considered ‘export quality’. 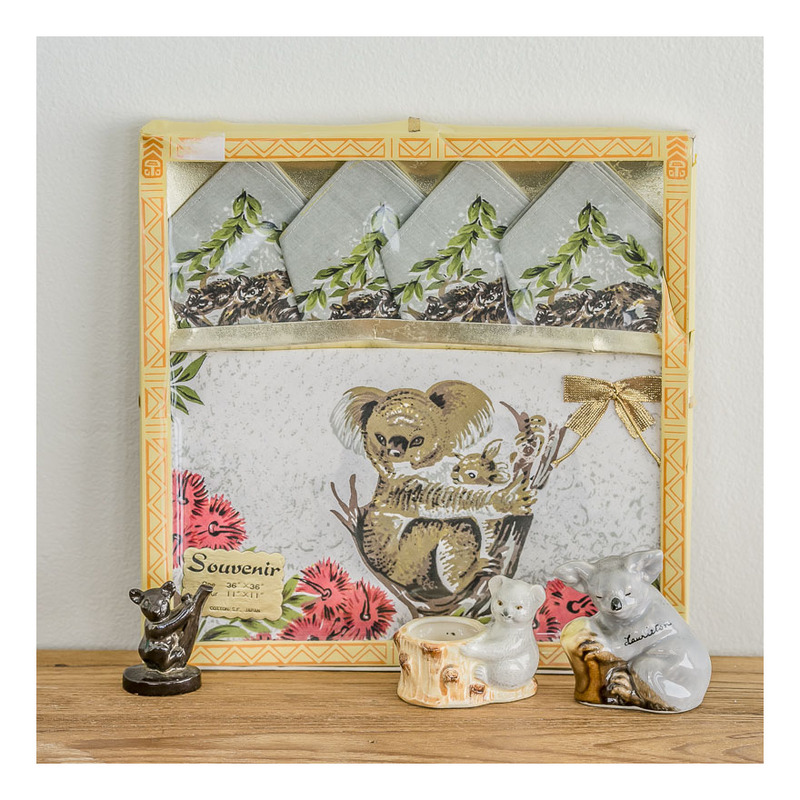 The kitschy koala transfer print just adds to the hokey, kitschy quality. The whole ensemble has a little brass stand at the back to keep it upright, and a little brass pocket on the front for one to arrange the date. Alas, as everyone knows with perpetual calendars, one keeps forgetting to actually change the date and the digital calendar starts to seem not so boring after all. 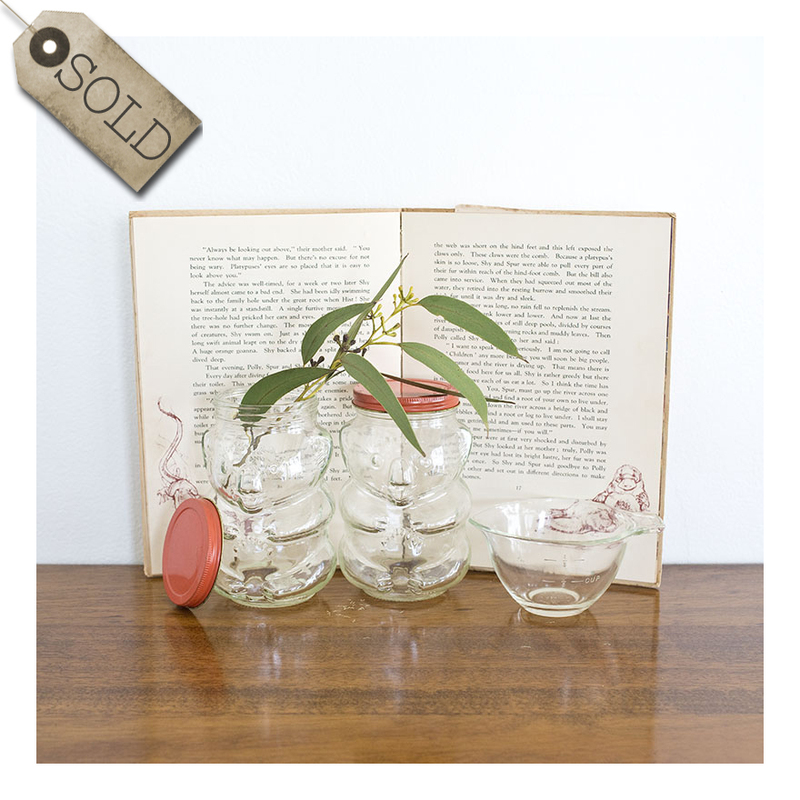 These adorable koala jars originally held vegemite and were sold as collectible / reusable jars back in the 70s. You can date the jars to that era as they have their original metal lids; by the 80s the metal lids were replaced with big chunky plastic lids. Not nearly as nice. So far my koala jars have held: boiled lollies, buttons and zips- clearly not all at the same time. I like the way the colours of the small objects inside the jar flesh out the koala’s contours; you can’t appreciate the cuteness of the koalas in my photo while the jars are empty. Since collecting these two jars I have added a third- with its original yellow and black Kraft metal lid. SO cute. Those lids were made to last- they are still air-tight after 40-odd years. As attested by my boiled lollies! Imagine a kitchen filled with koala jars. Koala jars filled with every known lolly. Or- you know- rice and flour and stuff.